My love for smoothies began ages ago, long before shops like Jamba Juice were seemingly popping up everywhere. However, I always had a tough time drinking them because my teeth just didn't agree with their achingly cold temperature. Luckily though, several years and a few root canals later, I can finally enjoy a smoothie with the best of 'em. 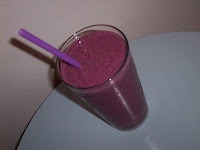 Following is my super-healthy, breakfast smoothie recipe. Please be sure to use frozen fruit without any added sugar/syrup when you make it - the fruit is definitely sweet enough on its own. Also, I like to include "nutritional add-ons" like flax seeds (for the Omega 3s), psyllium husks (for extra fiber), and soy protein powder (for an added boost), but you don't have to, of course. I've marked the optional add-ons with an asterisk, in case you want to keep things simple. This smoothie tastes great either way! 1.) First, place all of the frozen ingredients in the blender, followed by the banana, oatmeal, add-ons (if using), & soy milk. 2.) Press the smoothie/blend button on your blender, & allow the frozen ingredients to break down & mix with the rest of the ingredients. 3.) Remove the top from the blender periodically, & use a spatula to scrape the ingredients down the sides. 4.) Continue blending until the mixture is as smooth as you'd like. Add additional soy milk, if needed. Tip: Allow frozen fruit to sit at room temperature for a few mins before starting, which helps the smoothie blend more quickly.